“Chocolate”, One of the finest thing in life which can bring a smile to one’s face which also has many beneficiary solutions to your mood swings and many more things. The most important is its solution to your skin problems. The high amount of anti-oxidants present in it can add a healthy glow to your skin and keeps the ageing factors away. It consists of an anti-oxidant namely flavonoids which protects your skin from sun damage, as it acts as a good sunscreen. The presence of flavonoids in chocolate helps to provide you clear and glowing skin. Here are some amazing homemade chocolate face mask for your glowing and flawless skin. To the one tablespoon of honey, add one tablespoon of cocoa powder to it. Add a small amount of cinnamon powder to the mixture and mix them properly. Apply the mixture on your face and let it settle for about 15-20 minutes. Cinnamon has the antibacterial properties which reduce the acne as it helps in getting rid of the dead skin cells. Honey, on the other hand also helps in preventing the acne or pimples. Boil one cup of the green tea and let it cool down at the room temperature. Add one tablespoon of the cocoa powder and raw milk to the green tea. Mix the three ingredients together properly. Apply the mixture on your face and keep it for about 20-25 minutes. Wash your face with luke water. Green tea consists of a large amount of the antioxidants and minerals which helps in the treatment of premature ageing. Similarly, the Lactic acid in the raw milk helps in getting rid of the dead skin cells and gives glow your face. Melt the dark chocolate in a bowl. Add one tbsp. of peanut butter and some milk to the melted chocolate. Mix them properly in the bowl. Apply the mixture to the face evenly and keep it for 15-20 minutes. Wash your face with luke warm water. Peanut butter comes with many beneficial health and beauty benefits. It consists of minerals, protein and magnesium etc. It helps in nourishing the skin. Melt the dark chocolate taking the help of a double boiler. Mix the melted chocolate with one tbsp. of olive oil and one egg yolk. Mix the ingredients properly and then apply on your face and neck. Once or twice in a week. Olive oil is rich in vitamin E which acts as an anti-oxidant and protects the skin from the sun damage and keep it moisturized. One the other hand, egg helps to keep the skin smooth and soft. Blend them and make a strawberry pulp. To this, add one tbsp. of cocoa powder and honey. Mix the ingredients well and then apply directly on your face and neck. Keep it for about 10-15 minutes and then wash it off with warm water. Strawberries consist of the vitamin C which helps in nourishing your skin. The salicylic acid present in it helps getting rid of pimple or acne. Honey helps in delaying of the appearance of marks and wrinkles. It deep conditions the skin and makes it softer. Blend the pomegranate without seeds and make a paste. To this paste, add some cocoa powder and one tbsp. honey and stir them well. Apply the mixture on your face and neck and keep it for about 15-20 minutes. Pomegranate is highly rich in anti-oxidants as compared to the green tea. It is effective in fighting the free radicals and protects the skin from damage. Its natural properties help in keeping the skin glowing. Mix ¼ cup of cocoa powder with 2 tbsp of multani mitti in a bowl. Add 2 tbsp of yogurt and 1 tbsp of lemon juice and coconut oil to it. Mix all the ingredients and then apply it on your face and neck. Let it settle for about 15-20 minutes and then wash your face with warm water. Multani mitti has the properties of skin purification. It purifies your skin and removes the unwanted dirt from it. It also helps in getting rid of a large amount of oil on your face. Yogurt helps in renewing your skin and protects from the damage. Lemon juice, on the other hand, helps in the brightening of your skin. Mix one tbsp. of besan along with the cocoa powder and the cinnamon powder. Add 3 tbsp of shea butter and one tbsp. of vitamin E oil to the mixture. Add a few drops of lavender oil to the mixture and mix them properly. Apply evenly on your face and let it settle for about 30 minutes. Vitamin E has the pigmentation properties and nourishes our skin. It restores the skin health and keeps it healthy. Besan helps in keeping the dirt away from our skin and maintain the dead skin cells. Mix one tbsp. of powdered oatmeal with one tbsp. of cocoa powder in a bowl. Add fresh malai also known as the milk cream and a large amount of honey to it. Apply this paste on your face and let it be there for 15 minutes. Wash your face with fresh water. Malai has the goodness of milk and also many other benefits such as it consists of many vitamins and minerals which heals the dryness and makes the skin soft. It contains lactic acid which helps in maintaining the skin texture. Oat meal, on the other hand, moisturises the skin. Take a bowl and add 1/3 cup of cocoa powder to it. To this, add 2 tbsp of gram flour or besan and mix them properly. Add to this mixture, 4 tbsp of honey and one tbsp. of yogurt and again mix them properly. Apply this paste to the face and keep for about 15 minutes and then wash it off with water. Gram flour is a good ingredient for the oily skin as it absorbs the oily skin and helps in getting rid of the dirt. Yogurt acts a good moisturiser and helps in protecting the skin from the various damages. To ¼ cup of cocoa powder, add one tablespoon clay, yogurt, one teaspoon of lemon juice and coconut oil. Mix them properly and then apply directly on your face. Leave it for 10-20 minutes and then wash it off with warm water. Lemon juice helps in unclogging the pores and gives brightness to the skin. Blend the watermelon and strawberry properly and then add chocolate to it. Apply this mask on your face and keep it for about 15 minutes. Both watermelon and the strawberry acts as hydrators which hydrates your skin. This face mask is quite useful in summers. To 5 tbsp coffee powder, add 5 tbsp chocolate powder and milk cream with 2 tbsp coconut mik. Mix them properly in order to make a paste. Apply the paste on your face and neck for 30 minutes. The coconut oil nourishes and hydrates your skin and the milk cream makes your skin soft and cocoa powder has anti-inflammatory properties which smoothens your skin. Mix cocoa powder with honey and 2 tbsp brown sugar in order to make a thick paste. Gently peel off the mask after 15 minutes. Honey kills the bacteria and helps in moisturising your skin, whereas cocoa powder removes the dead skin cells. Mix 1 tbsp of cocoa powder with the sour cream and honey. Make a paste and then massage on your face for 20-25 minutes. Honey helps in deep cleansing your skin and the cocoa powder has anti-oxidant properties and cream moisturises your skin. Mix the ingredients together properly and make a paste of it. Allow it to dry and then wash it off with the help of water. The cocoa powder consists of flavonoids which helps in preventing the free radicals. The minerals present in the avocado and the coconut milk helps in smoothening your skin and makes it soft. Mix one tbsp. cocoa powder and ½ cup mashed banana together. Add honey and yogurt to the mixture and then again mix it well. Banana helps in maintaining elasticity of your skin whereas cocoa powder having anti-oxidant properties helps in softening your skin. Blended mixture of watermelon, apple, banana and strawberries. Take 1 tablespoon of dark melted chocolate in a bowl. Add blended mixture of the fruits to it. Gently mix the mixture and make a paste. Apply this paste on your face and neck for about 30 minutes. The mixture of different fruits helps in hydrating your skin and also helps in toning up of skin. As we all need pampering, our skin too wants it. Hence, we can pamper our skin by just taking care of it. All we can do is to prepare the above-given face masks at home and apply on our face. The cocoa powder has anti-oxidant properties which moisturize skin. Fruits, on the other hand, hydrates skin and provides a glow to the skin. Green tea also has some anti-bacterial properties which helps in getting rid of the free radicals. 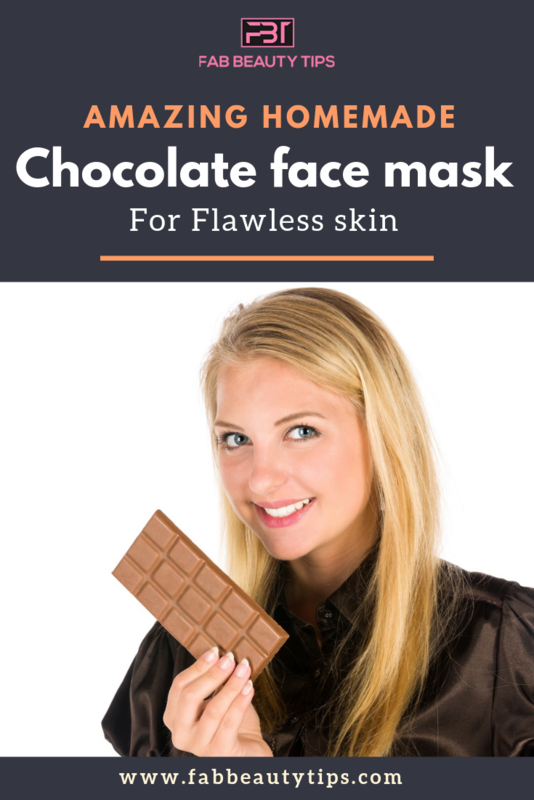 In all, we can save our skin from many kinds of damages by applying such homemade chocolate face mask. What a wide range of chocolate face masks. I like the fact that many of these integrate some of the traditional ingredients like Multani Mitti with chocolate. These are definitely masks which are good to try during this festival season. Thank you for compiling this information. It looks like you have put in a lot if research and effort into this post. I love to eat chocolate but now I will apply it to my face too! Chocolate has antioxidant property. Thanks for sharing such useful tips for skin care. I love Chocolates but never tried them in face masks. 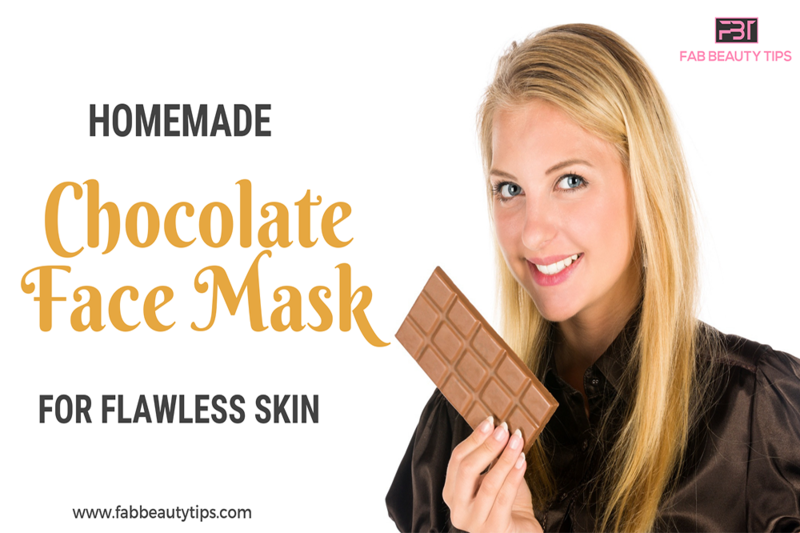 Its easy with just simple ingredients at home to make a chocolate mask. Now, these face mask recipes sound really yummy! Especially peanut butter and chocolate and cinnamon and chocolate ones… I would definitely try these! I never knew that chocolate face masks can be good to prevent acne too. Chocolate honey mask sounds a great option for healthy glowing skin. I would like to know which cocoa powder would you recommend? Wow that’s awesome, I loved all the face mask recipes. I am Surely to try many of them.